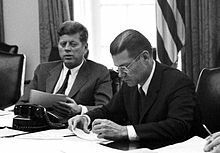 President John F. Kennedy and his Secretary of Defense| Robert McNamara deliberate during the crisis. The Cuban Missile Crisis, also known as the October Crisis, the Caribbean Crisis, or the Missile Scare, was a 13-day (October 16–28, 1962) confrontation between the United States and the Soviet Union concerning American ballistic missile deployment in Italy and Turkey with consequent Soviet ballistic missile deployment in Cuba. The confrontation is often considered the closest the Cold War came to escalating into a full-scale nuclear war. President John F. Kennedy, "1962 Year In Review: Cuban Missile Crisis". United Press International, Inc.. 1962. To halt this offensive buildup, a strict quarantine on all offensive military equipment under shipment to Cuba is being initiated. All ships of any kind bound for Cuba, from whatever nation or port, will, if found to contain cargoes of offensive weapons, be turned back. This quarantine will be extended, if needed, to other types of cargo and carriers. We are not at this time, however, denying the necessities of life as the Soviets attempted to do in their Berlin blockade of 1948. My fellow citizens: let no one doubt that this is a difficult and dangerous effort on which we have set out. No one can see precisely what course it will take or what costs or casualties will be incurred. Many months of sacrifice and self-discipline lie ahead--months in which our patience and our will will be tested--months in which many threats and denunciations will keep us aware of our dangers. But the greatest danger of all would be to do nothing. The path we have chosen for the present is full of hazards, as all paths are--but it is the one most consistent with our character and courage as a nation and our commitments around the world. The cost of freedom is always high--and Americans have always paid it. And one path we shall never choose, and that is the path of surrender or submission. Our goal is not the victory of might, but the vindication of right- -not peace at the expense of freedom, but both peace and freedom, here in this hemisphere, and, we hope, around the world. God willing, that goal will be achieved. President John F. Kennedy, President John F. Kennedy on the Cubam Missile Crisis. The History Place. Fifty years ago, the Cuban missile crisis brought the world to the brink of nuclear disaster. During the standoff, US President John F. Kennedy thought the chance of escalation to war was "between 1 in 3 and even," and what we have learned in later decades has done nothing to lengthen those odds. We now know, for example, that in addition to nuclear-armed ballistic missiles, the Soviet Union had deployed 100 tactical nuclear weapons to Cuba, and the local Soviet commander there could have launched these weapons without additional codes or commands from Moscow. The US air strike and invasion that were scheduled for the third week of the confrontation would likely have triggered a nuclear response against American ships and troops, and perhaps even Miami. The resulting war might have led to the deaths of 100 million Americans and over 100 million Russians. Graham T. Allison, Allison, Graham (2012). "The Cuban Missile Crisis at 50". Foreign Affairs 91 (4). Pentagon leaders urged Kennedy to attack Cuba -- a possibly dangerous move that could have triggered a nuclear war with Moscow. Assuming nuclear weapons would not be used on the island against American invading forces, war planners expected as many as 18,500 US casualties within the first 10 days of a Cuban invasion, according to a now-declassified top secret Pentagon memo. "Missile crews were placed on maximum alert," Robert F. Kennedy wrote. "Troops were moved into Florida and the southeastern part of the United States. ... The Navy deployed 180 ships into the Caribbean. ... The B-52 bomber force was ordered into the air fully loaded with atomic weapons." But the idea of a surprise US attack on Cuba didn't sit well with some of the President's advisers, including his brother. "... a surprise attack would erode if not destroy the moral position of the United States throughout the world," Robert F. Kennedy wrote in his book. Thom Patterson, "JFK's 'secret' doomsday map revealed", CNN, (04/06/2018; updated Thu April 12, 2018). At the time of the missile crisis, the Soviets had 36 intercontinental ballistic missiles (ICBMs), 138 long-range bombers with 392 nuclear warheads, and 72 submarine-launched ballistic-missile warheads (SLBMs). These forces were arrayed against a vastly more powerful U.S. nuclear arsenal of 203 ICBMs, 1,306 long-range bombers with 3,104 nuclear warheads, and 144 SLBMs—all told, about nine times as many nuclear weapons as the U.S.S.R. Nikita Khrushchev was acutely aware of America’s huge advantage not just in the number of weapons but in their quality and deployment as well.